RightITnow ECM is a powerful event correlation and process automation platform for optimizing IT Operations. Built on a scalable architecture, RightITnow ECM can comprehensively manage dynamic and fast changing IT infrastructures for a business of any size. RightIINow ECM collects industry standard protocols and message formats events from most network devices, systems and web services environments. Its native integration with virtualization platform APIs enables near real-time event collection and management of physical and virtual infrastructure. RightITnow ECM seamlessly integrates with your EMS, providing a single platform consolidation of all infrastructure, application and business service events. RightITnow ECM out-of-the-box integrations include popular and widely distributed monitoring solutions like Solarwinds Orion NPM and VMware vCenter. RightITnow ECM users and development partners can use our Web services based APIs to easily integrate ECM with their existing IT management systems, enabling the process automation of IT workflows from event-to-alert-to-incident resolution. 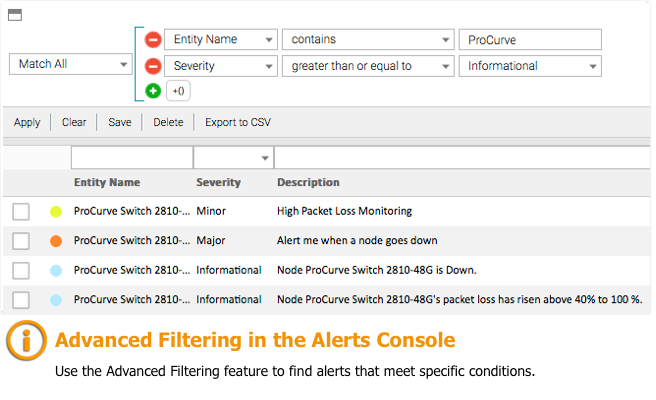 RightITnow ECM’s correlation algorithms enable it to identify, categorize, filter and reduce high volumes of raw infrastructure and application events into actionable alerts. These include de-duplication, X in Y occurrences, problem-solution pairings and topology based correlations, to name a few. 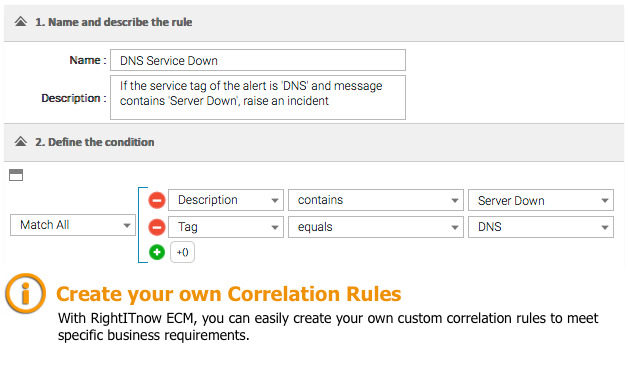 In addition, RightITnow ECM you can quickly create your own custom correlation rules to meet specific business requirements. With RightITnow ECM’s correlation intelligence you can address any scenario in today’s fast changing IT environment. RightITnow ECM’s Web 2.0 interface is incredibly easy to use, configure, and administer. With it’s feature rich UI and flexible controls, operators can customize views, displets and rules associated with categorizing, filtering, assigning or correlating alerts. No programming required. And with RightITnow ECM’s role-based administration of customer and infrastructure data, you can manage access to data and process elements, in line with your organizational compliance policies. Using rules-based event, entity and topology collection; automated correlation; and pre-defined problem resolution actions, RightITnow ECM makes it easy to automate IT operations processes. For example, with RightITnow ECM you can automatically escalate certain events to the Service Desk for incident (trouble ticket) creation. Or you could automate actions including running custom scripts to perform problem resolution – for e.g. rebooting a server or initiating a batch process. With RightITnow ECM, it’s easy to streamline your existing IT Operations workflows by automating routine or repeated operator actions. RightITnow ECM’s workflow automation capabilities extends to it’s integrations with other management systems. For example, RightITnow ECM can be configured for closed-loop removal of alerts when linked incidents or trouble tickets are ‘closed’ in the Service Desk. 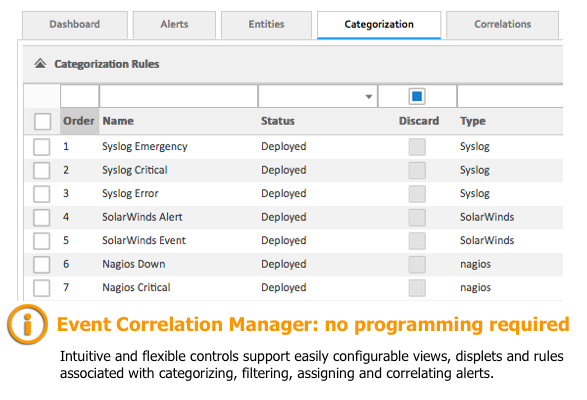 It can also communicate alert acknowledgement and closure to monitoring systems like Solarwinds Orion NPM. RightITnow ECM’s Bi-directional automation the event-to-alert-to-incident process plays a key role in optimizing IT operations and streamlining costs. RightITnow ECM can be installed in minutes and deployed in just a few hours. Configuration of both basic and advanced features is done using ECM’s drag and drop interface, unlike many legacy event management solutions which require mastery of complex and proprietary programming languages. Individual IT operators and administrators can adapt the views and business rules as per their requirements at local workstation or system-wide levels, without having to depend on specialized development staff to incorporate changes.